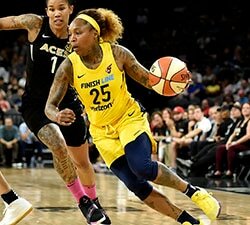 After its 79-69 victory over the Seattle Storm, the Phoenix Mercury now travels to take on the fourth-seeded Connecticut Sun in the single-elimination second round on Sunday at Mohegan Sun Arena (3 PM ET, ESPN2). Here’s a look into players that could be X-factors in Sunday’s contest. 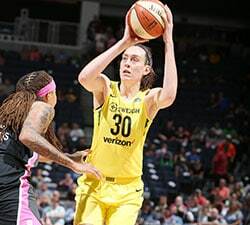 As the top scorer in the WNBA during the regular season, Brittney Griner (21.9 PPG) will always make an impact, but as shown in the final minutes of the Mercury’s victory on Wednesday, Diana Taurasi can lead a team with her experience and clutch gene. Taurasi is a perfect 10-0 in deciding playoff games in her career, and has shown time and time again that she can change the game on and off the court in the most important moments. In Wednesday’s game against the Storm, Taurasi hit a clutch three-pointer, before throwing a one-handed pass to Leilani Mitchell on the very next possession, leading to a three to put the Mercury up by eight and essentially seal the game. It was also shown during the final minutes of that game how Taurasi becomes a player-coach at pivotal times in the game. In the final quarter against Seattle, Taurasi set up an in-bounds play with one second left on the shot clock. It worked to perfection, as she lobbed the ball to Griner, who tipped it in the basket. It doesn’t matter how Taurasi starts the game, but if the game is close, you can never count her out.
.@DianaTaurasi opens the 2nd half by scoring her 1,000th career #WNBAPlayoffs points! Jonquel Jones has led the Sun both in scoring and on the boards this season. The All-Star center will need to continue to step up in postseason, but that’s obvious. Depth and contributions from others will become key in Sunday’s contest. Shekinna Stricklen is a name that comes to mind, because of her ability to make shots, especially from the outside. Stricklen has the second best three-point shooting percentage on the team (41%), while holding her own from the free throw line (86.5%) as well. 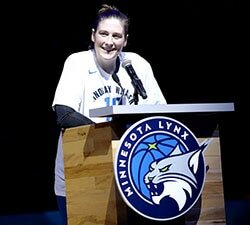 As it is with Taurasi, Stricklen brings experience to the table for the Sun. 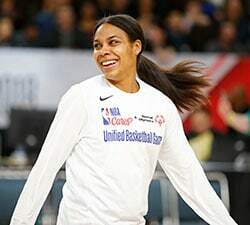 Connecticut doesn’t boast a lot of experience, but Stricklen does bring some, having been in the playoffs twice in her six-year career. Pairing her experience with the skill and energy of the young stars on the team like Jones will be key for Connecticut to come away with a victory.